A month or so ago I applied for the March/April round of exhibits at the Windlight Art Gallery (1) in Second Life. Kultivate (2) have a few opportunities for artists listed on their website and I have hesitated to apply for a long time because I really needed to work on my photography skills. I took a friend to the last exhibit there and as we looked around the artworks, I had talked about wanting to be a part of an online exhibit. So, this time around…I thought, well…WHY NOT? What was the worst thing they could say? No? I am actually ok with that. You can be rejected for any number of reasons and those reasons are not at all personal. So on an impulse, I filled out the form (3) and sent it off. And I was accepted. I was sent my acceptance package in world about a week before set up. It was really clear and well thought out. It included all the information I needed to know. It had notecards to fill out with for my Bio and my Photo, a notecard of welcome, one clearly stating out the Windlight Gallery terms and conditions and another with the anticipated timeline. It also included the landmark I needed. When I got there, my space was already set up with my name in my spot and there was a mailbox to drop my completed bio and photo notecards into. I wondered whether it would be different to exhibiting in the physical world (4). And HOW it would be different. Well the truth is..it wasn’t a whole lot different. But the differences that are there, are stark. The biggest difference to me is that it’s a lot quieter. You go in, set up in your space, send your bio in and there it is. Usually the atmosphere in a physical world exhibit is excited and anticipatory. There is a sense of camaraderie and enthusiasm for the opening. People chat and help one another set their things out and look at each other’s works and appreciate them. On the days I was setting up I only came across two other people. One I had a quick chat to in order to find out how to actually exhibit my photos. I wasn’t sure whether to frame them or whether to just texture a prim with them. (The answer is you just texture a prim with them) But that is all that we chatted about as I felt really self conscious about taking up someone else’s time. I really missed that physical world atmosphere. It’s one of the times you feel less isolated with your work. One of the things that is difficult about being in world is that the cues for social interaction are so very different. I can’t read someone’s body language or facial expression to see whether I am annoying them by taking up their time or whether they are happy to sit and chat for a bit. So I tend to err on the side of caution and keep the conversation short and cheerful. I don’t have to sit in the gallery to make sure people don’t touch the artworks or steal any of the tech but this also means that I don’t get to talk to people about the art that is being exhibited or see people’s faces or hear them discussing things. Each of the photos that are up can be reproduced over and over. They are priced for sale and if people choose, they can purchase them without contacting me at all. At a real life exhibit, if things are priced for sale, there is usually some contact between the artist and the consumer to have artworks delivered or payment arranged. Once again, the SL experience tends to be a little on the isolating side, both for purchasing and also not having to gallery sit. I am making assumptions that the bump out will feel the same. there will be no congratulating chatter with other artists about an exhibit well done or discussions about upcoming exhibits and who will be showing when and where. There will just be a silent pack up of prims and a teleport out. We all will have dispersed quietly to our second lives without ever having had real contact with one another. 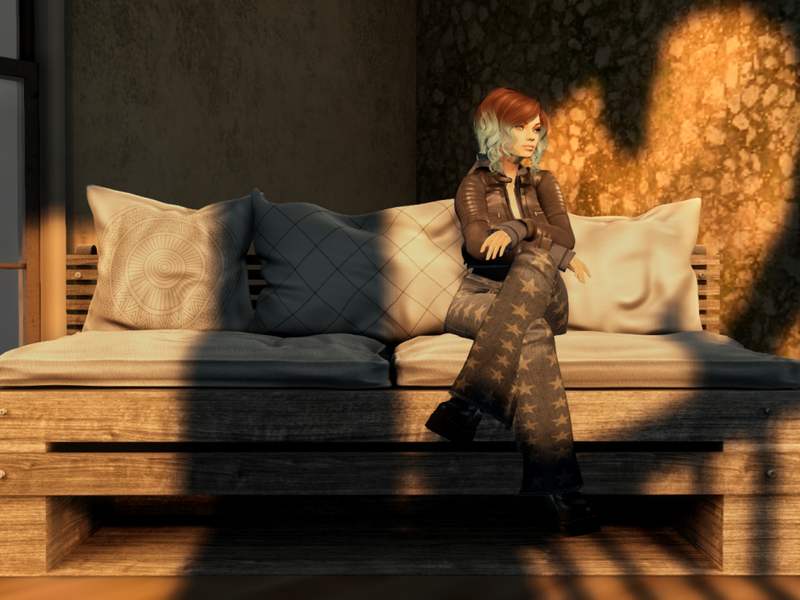 My biggest regret is that there was an opening event on the 4th of March at 1pm SLT, that I unfortunately had to miss because the difference in time zones means that I will be otherwise engaged in my real life at that time. It would have been the one time I was able to meet up and chat with the other exhibitors. The exhibition itself will run from the 4th March through until April, so if you have a spare moment, go check it out and see what some of the artists of SL are doing in the exhibit.